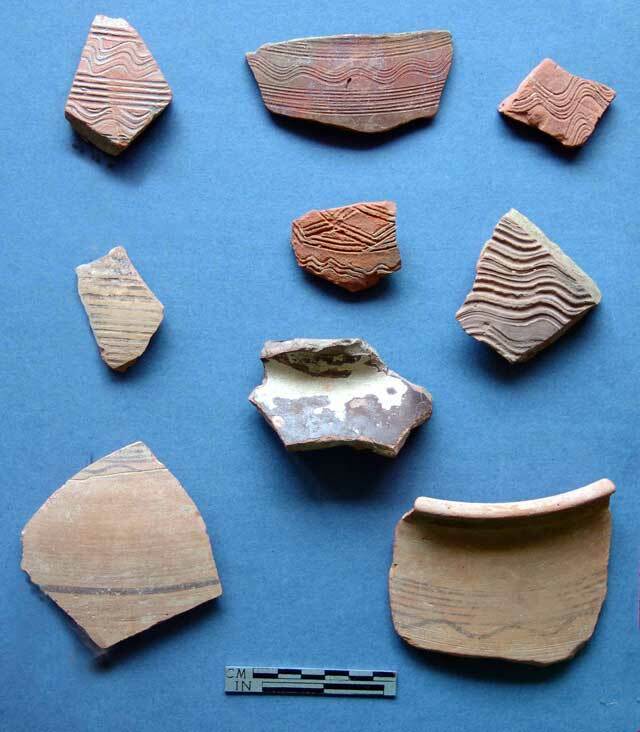 Harappan evidences in Chautan valley has a unique ceramic tradition. In the light of recent plethora of knowledge as well as against the background of the studies conducted by A. Ghosh, J.S. Nigam, Katy Frenchman, Suraj Bhan & Madhu Bala, we will have to not only reclassify the Sothi-Siswal ceramic assemblage but also alter basic nomenclatures and concepts involve in it. It will give us deep insight in to the process of evolution of Early Harappan cultures vis-à-vis the dynamic of regional cultural complexes. The Harappan culture, first proto-historic civilization of the South Asia, is distinctively characterized by typical set of ceramic assemblage, unparallel to any other culture prevalent in the sub-continent. 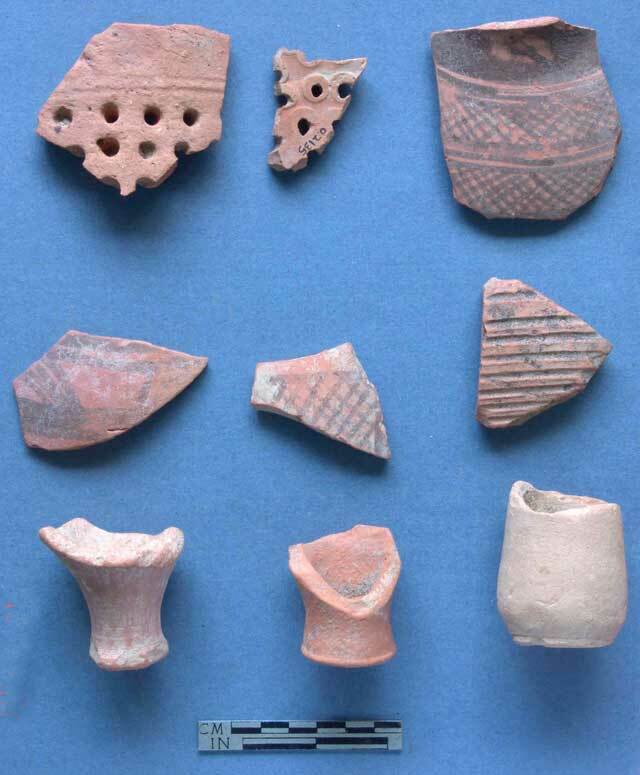 A typical generalized assemblage of ceramics is referred as 'Harappan pottery'. In spite of assumed monotones uniformity through out the Harappan domain (about one million sq. km. ), Harappan pottery has demonstrated considerable dynamism in terms of form and surface treatment over the time and space without loosing its own character. On the basis of geographical zones the area of Harappan influence is divided into seven provinces -Northwestern domain, Kulli domain, Sindhi domain, Harappa domain, Cholistan domain, Sorath domain and Eastern domain (Possehl, 1997:438). The criterion of this division is not only geographical pocket, but also existing variable ceramic traditions, beneath classic Mature Harappan ceramic assemblage. The formative phase of this civilization is marked with various sets of ceramic assemblages- Amri, Nal, Kot-Diji, Sothi-Siswal etc, now collectively known as Early Harappan cultures. Earlier these cultures were taken as separate entity, unrelated to the classic mature phase of the Harappan civilization. But now it clear that the Mature Harappan characteristic was a logical development of traits already set by the Early Harappan cultures. In terms of pottery, 'Harappan' element became strong in the Mature Harappan period and weakened afterwards. 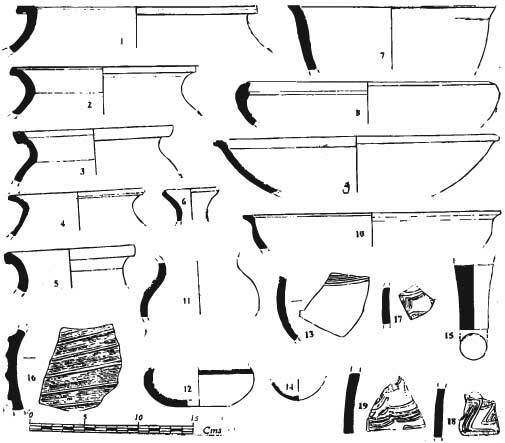 The Late Harappan period again shows various sets of ceramic assemblages with regional variations carrying influence of the Mature Harappan period. 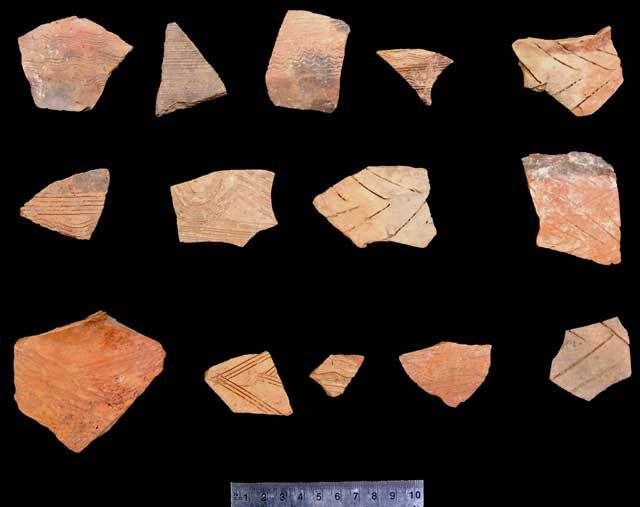 The present article is an attempt to reassess ceramic traditions prevailed in the Chautang basin, also a part of the Eastern domain during the Harappan era of influence. A. Ghosh was the first scholar to notice this regional divergence (Ghosh, 1987:101) in the Ghaggar-Chautang devide. Following explorations of Ghosh in 1951-52, the Archaeological Survey of India carried out excavations at Kalibangan for nine field seasons (1960-1969). 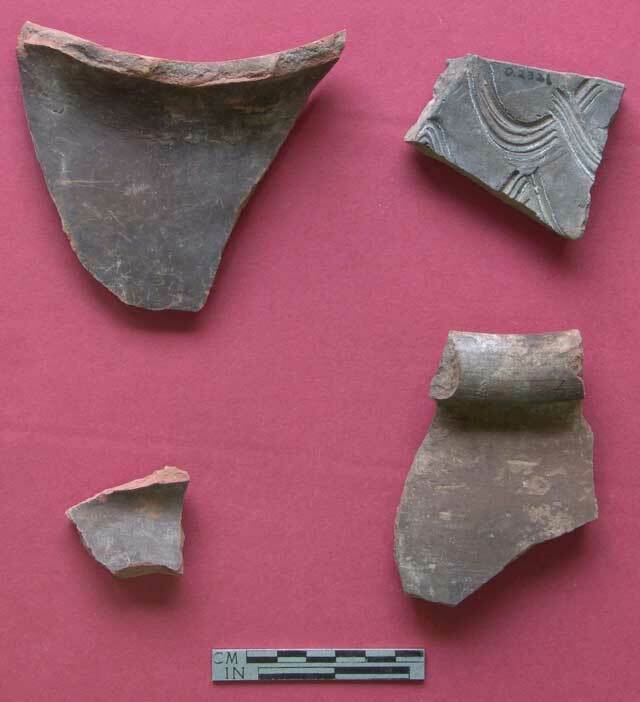 The early Harappan pottery designated as Sothi assemblage by Ghosh, was recovered for the first time in the stratigraphical context. B.K. Thapar elaborately studied this pottery and classified it into six fabrics - A, B, C, D, E and F (IAR-1962-3:20-3). This classification still remains basis of description of early Harappan ceramic assemblage reported in explorations and excavations. However, J.S. Nigam proposed revised classification of 'Sothi pottery from Kalibangan' in the traditional category of the wares (Nigam, 1996:7-14). Suraj Bhan carried out explorations in the Haryana between 1967 to 1970 along the dry channels of Ghaggar and Chautang. As a result, he was able to place 97 Prehistoric sites on the map and also conducted small-scale excavations at Mitathal, Daulatpur and Siswal. He also established a chronological sequence from Kalibanagan I culture to Late Harappa culture (Bhan, 1972:315) of the prehistoric settlements of this region. He is credited to have brought to light a new ceramic industry related to Kalibangan I ware known as Siswal. This is defined as a separate culture existing parallel to the Kalibagan I, Mature Harappans and its further survival through late period in Daulatpur (Late Harappan) and Atranjikhera (OCP) cultures (Bhan, 1975:111). 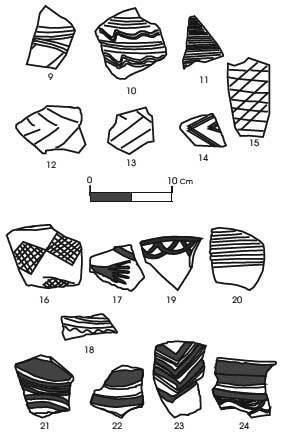 Recently, Amarendra Nath has reported all the six Kalibangan type fabrics of the early Harappan ceramic industry in excavations at Rakhigarhi including the technique of surface treatment, shapes and decorative elements (Nath, 1998: 39-45). So far as the Mature Harappan ceramic assemblage is concerned there seems to be no confusion regarding its identification and classification. 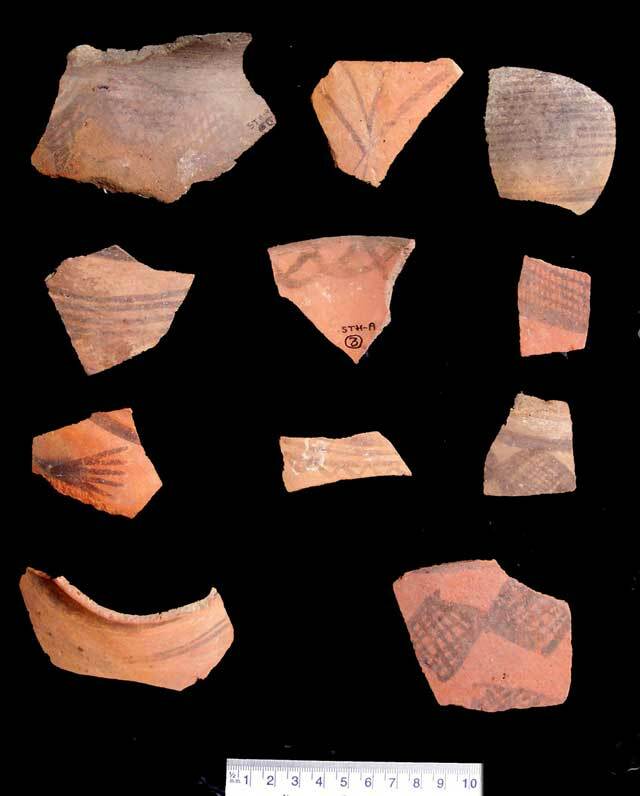 The Early Harappan ceramics have been subjected to detailed classification marking datum line for the ceramic studies often referred as six fabrics of Kalibangan by almost every research scholar working in this area. 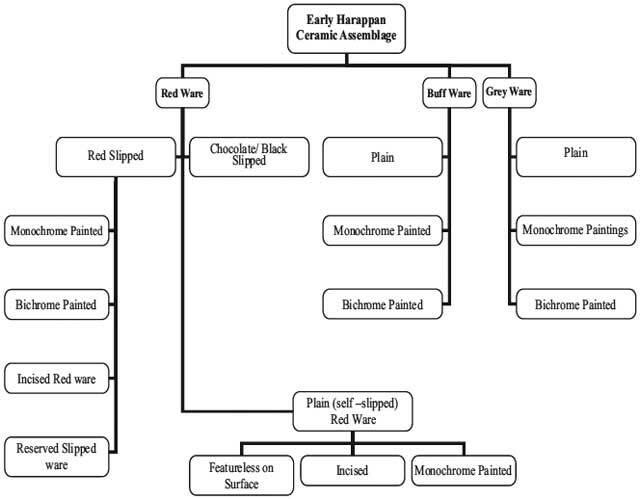 The present article explores possibilities of a more reasonable classification of the Early Harappan ceramic assemblage. Hence, an attempt is made to re-define 'Early Harappan' with the help of pottery recovered in the explorations carried out by the present author as a part of his PGDAdissertation (Garge, 2001) and explorations (2004-05) for PhD thesis. The pottery from the type-site Sothi, recovered in the excavations by A. Ghosh in 1952-3, now stored in Central Antiquity Collection of ASI in Purana Quila, New Delhi was also studied with the same objectives. The ceramics from Sothi, Siswal, Lohari Ragho, and Shyamlo Kalan are taken into consideration for discussion. L.P. Tessitori discovered the ancient site of Sothi; later it was visited by Aurel Stein (1942), Ghosh (1950-53), Dikshit (1979), K.F. Dalal (1980). It is located in the plain of the ancient river Drishadwati at a distance of about 10 km. southwest of Nohar, a railway station. It is a low mound merging with the surrounding sandy land, except for some swells in the middle with potsherds spread on surface in an area of about 200x200 sq. meters. A. Ghosh laid six trial trenches at Sothi numbered as STH-A to STH-F. The STH-A was on the top of the mound, while STH-B on the slope. The occupational deposits of about 60 cm and 30 cm were encountered at STH-A and STH-B respectively. K.N. Dikshit laid a trial trench revealing an accumulation of 3.40 m on the western side of the mound. 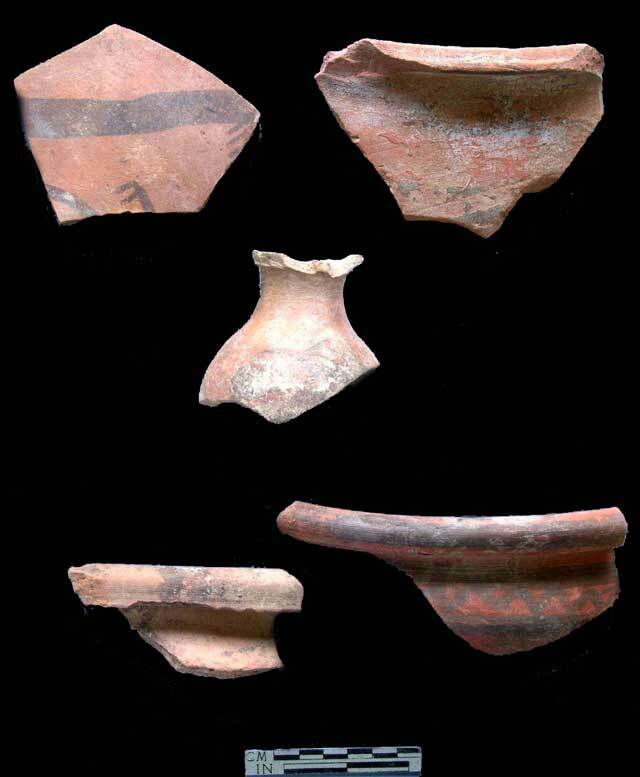 From the upper levels Harappan pottery mixed with Sothi ware was found on the upper level whereas the lower level yielded only Sothi ware. The mature Harappan phase was confined to upper 0.50m. deposit has yielded terracotta triangular and round cakes, balls pierced in the middle with four divisions, cart-frames and bangles. The selected specimens from Sothi, now stored in Purana Qila are described as below. 1. Fragment of a small vase with straight everted rim, medium to course fabric, 2. Upper portion of a small pot with externally projecting rim and short neck well fired medium fabric, 3. Upper portion of a small sized globular pot with slightly externally projected rim and well fired medium fabric, 4. Upper portion of a red ware medium size bowl with out-turned beaded rim and slight carination on shoulder, 5. Fragment of ledged base of a dish with medium to fine fabric, 6. Fragment of a small vase with short featureless rim with almost straight neck applied with chocolate slip on the exterior medium fabric, 6. Fragment of a small vase with short featureless rim with almost straight neck applied with chocolate slip on the exterior having medium fabric, 7. Fragment of a medium sized vase with out turning rim with concave neck and globular body with medium fabric applied with tan/chocolate slip on neck and body portion, 8. Fragment of a vase with out turned rim, thin section black slip on neck and body portion, irregular striation marks on interior, 9. Incised red ware with horizontal parallel lines and diamond pattern, 10. Incised red ware with horizontal alternative sets of straight and wavy parallel lines, 11. Buff ware with incised horizontal parallel lines, 12. Red ware with horizontal V pattern incisions, 13. Red ware with horizontal intersecting V pattern incisions, 14. Incised red ware with horizontal V motif with multiple lines, 15. Incised red ware with criss-cross pattern, 16. Self slipped red ware with black paintings interconnected parallelograms with criss-cross pattern, 17. Red slipped ware with floral motif painted in black, 18. Red Slipped sherd with horizontal parallel lines and a single wavy line painted in black, 19. Intersecting loops painted in black on rim portion of a red slipped bowl, 20. Buff ware with horizontal lines painted in black, 21. Red slipped pot with thick horizontal parallel bands and loops painted in black, 22. Red slipped sherd with alternative thick bands of painting in black and white colours respectively, 23. Red slipped ware with alternative V shaped bands in white and black pigment, 24. Red slipped jar of small size with thick horizontal black band on neck and thin horizontal black band with wavy lines sandwiching a white band. The Siswal village is located 26 km to the west of Hissar. The mound is situated 300m to the north of the village on the left bank of the Chautang Canal. This was reported for the first time by Suraj Bhan and according to his description the mound was 300 x 200 x 2.5 m in area with north- south as the longer axis. The north-eastern portion of the site was converted into suitable terraces for cultivation. A small trench of 2 x 2 m was sunk by him in 1970. The maximum habitation deposit found here was 1.25 m above the natural soil. He divided cultural deposit into Siswal A and Siswal B. Bhan characterized Siswal A by the presence of classical Kalibangan I – A to E fabrics. He has also noted a clear trend of evolution in typology from the lowest to the upper levels. The evolved shapes are compared to Mitathal I pottery. He has also reported few sherds of the Mature Harappan period from surface of the mound (Bhan 1972: 42-3,100-3). The potsherds sampled from Siswal are described as below. 1. Miniature pot of red ware with short out-curved rim and thick horizontal black band on neck and lower part of body portion, 2.Upper portion of the red ware jar with simple out-turned rim and black slip on the rim and neck portion, 3. 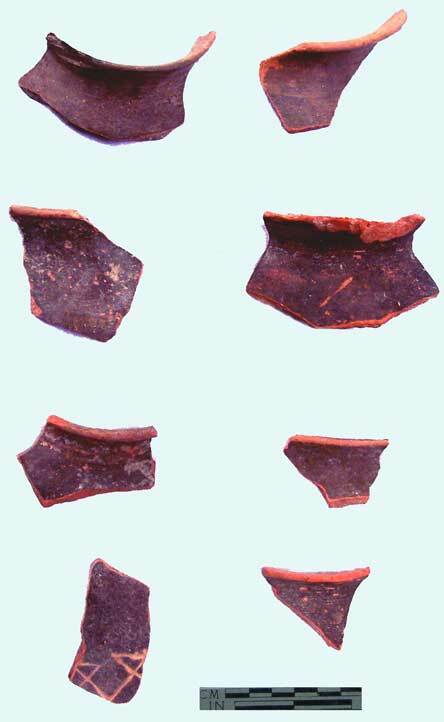 Fragment of a red ware sherd with black slip, 4.Fragment of a red ware basin with out-turned short beaked rim, 5.Fragment of a red ware sherd with buff slip and black painting in form of horizontal band, 6. Fragment of a red ware perforated jar, 7.Fragment of a small red ware sherd with horizontal wavy incisions on the interior, 8. Fragment of a red ware sherd with horizontal black band on the rim portions and incisions in form of horizontal and criss-cross lines, 9.Fragment of a red ware sherd with black slip on the exterior, 10. Fragment of a red ware sherd with black slip on the exterior. 11. Fragment of central portion of a red ware dish with incisions in form of concentric circle, 12. Fragment of rim portion of a red ware vase, 13. Fragment of a red ware sherd with thick horizontal band in black colour, 14. Rim portion of a red ware jar, 15. knob (? ), shaped like mushroom, 9 cm in height solid, on top potion a circular concentric circle incised with fish motif within. 1. Fragment of a medium to large red slipped globular jar with short out turned beaked rim with medium fabric, 2. Fragment of a medium size red slipped jar with short externally projecting rim having medium to fine fabric, 3. Fragment of a medium size red slipped jar having out turning beaded rim, 4. Fragment of a medium size pot/jar with narrow mouth and externally projecting rim, 5. Fragment of a medium to small size pot of plain red ware with out turned beaded rim, 6. Fragment of a vase of red ware of fine to medium fabric with narrow mouth and external everted rim, 7. Fragment of a bowl of red ware with medium fabric with convex profile and everted rim, 8.Fragment of a large shallow bowl with inverted/incurred rim. Red ware with slip and a horizontal groove on the neck portion, 9. Fragment of a basin of plain red ware having slip with flaring slides and an out turned rim, 10. Fragment of a medium size basin with out turned beaked rim and projecting shoulders, 11. Globular (lota) shaped pot of red slipped variety, 12. Bowl of small size red ware with slip and a horizontal black colour band on the neck portion, 13. Fragment of a pot with shallow incised horizontal lines on the shoulder portion un-slipped red ware, 14. Fragment of bottom portion bowl of red un-slipped variety, 15. Fragment of a narrow shaft of dish on stand of gray ware with slip fine fabric, 16. Fragment of a vase with prominent flutings on the exterior. Black slipped red ware fast wheel pottery, 17. Fragment of body part of a vase/jar of red slipped ware with medium fabric, 18. Fragment of body part of a vase/jar of red slipped ware with medium fabric and wavy incisions, 19.Fragment of body part of a vase/jar with wavy incisions. Red slipped ware with medium fabric. Amar Singh of Kurukshetra university reported two localities close to the village Simlo Kalan; 16 km to the south east of Jind on the way to Rohtak (Sing, 1981:80, 89). Now this mound is entirely destroyed by the brick –kiln. Finding even a few potsherds is difficult now. 1.Upper portion of a medium size red ware storage jar with short everted rim, the outer surface is applied with black slip, medium to fine fabric, 2. Upper portion of a medium size vase of red ware with simple everted rim with black/chocolate slip up to neck portion, medium fabric, 3. Upper portion of a medium size red ware vase with narrow mouth having short out turned rim, medium fabric chocolate/black slip up to neck portion with horizontal black bands on the body portion, 4. Upper fragment of a small vase with short beaked out turning rim with tan/chocolate coloured horizontal band on the external portion of the rim, 5. Fragment of a vase of red ware applied with black/chocolate slip on the exterior with medium fabric and ill firing, 6. 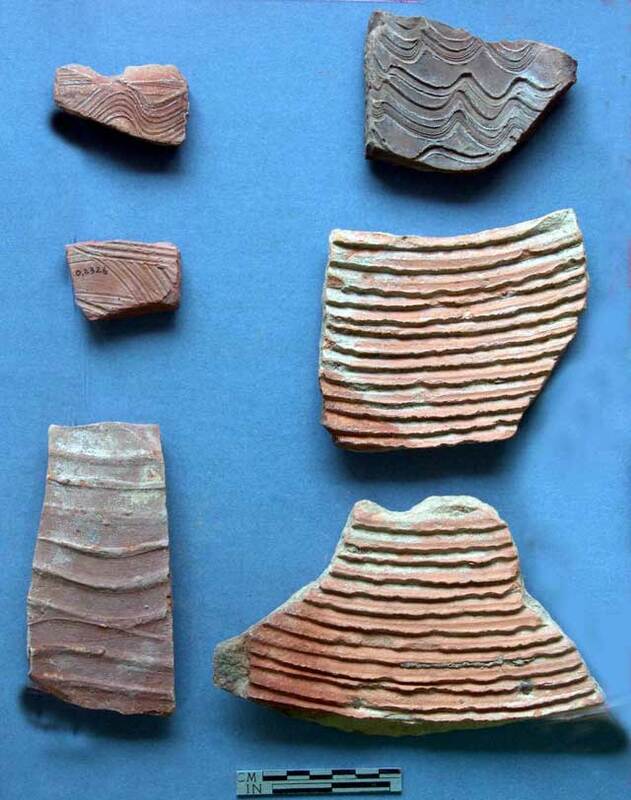 Fragment of a basin of red ware with thick parallel lines of grooves on the interior, medium to course fabric, self slipped, 7. Fragment of pot/vase with horizontal flutings on the exterior, plain self slipped red ware (probably Mature Harappan), 8. Fragment of a basin of self slipped Terracotta coloured red ware having thick incised wavy lines on the interior and rusticated surface on the exterior, 9. Fragment of a basin of self slipped red ware with thick parallel lines of grooves on the interior, medium to course fabric, 10. Fragment of a plain red ware with parallel grooves on the interior portion, 11. Fragment of a grey ware having intersecting thick wavy incision on the interior with medium fabric and rough exterior, 12. Fragment of red ware with oblique multiple incised lines forming diamond portion on the interior, 13. Fragment of Terracotta coloured red ware sherd with multiple incised wavy lines, on the exterior surface, 14. Fragment of a red ware sherd with black/chocolate slip on the exterior. 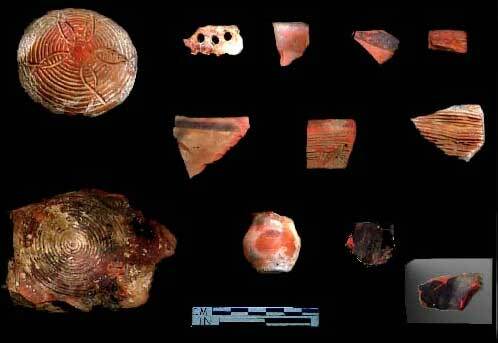 The description of ceramic assemblage from above four sites is taken as basis to define Early Harappan ceramic assemblage of the Chautang basin. 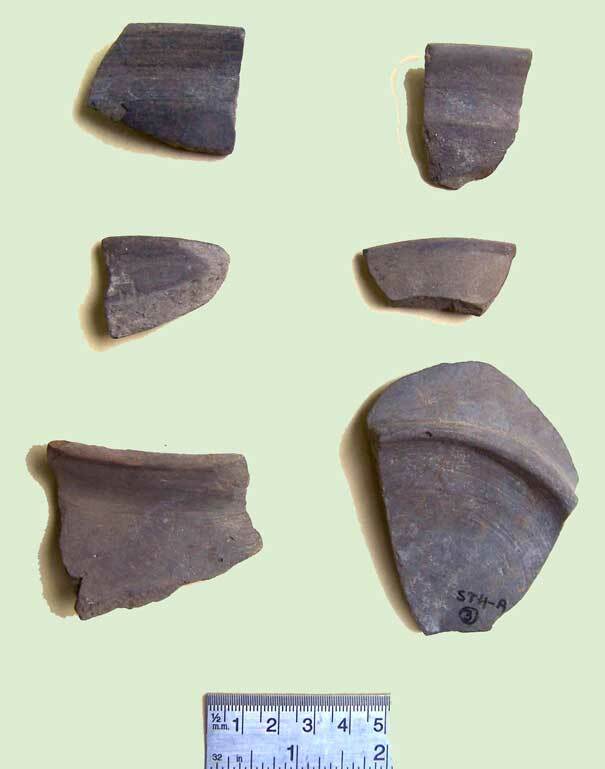 The early Harappan pottery designated as Sothi assemblage by Ghosh, was recovered for the first time in the stratigraphical context in excavations at Kalibangan. B.K. Thapar elaborately studied this pottery and classified it into six fabrics -A, B, C, D, E and F (IAR-1962-3:20-3). According to Thapar Fabric Ais dull red ware having red to pink colour in section and black paintings on surface; most importantly, pottery made on slow wheels having irregular striation marks. Fabric B is red slipped pottery rusticated up to shoulder with clayey solution mixed with sand having black horizontal bands on the slipped portion. Fabric C is again red slipped pottery with fine and smooth textured surface in shades of red and plum or purple- red colour with carefully executed paintings in black colour. Fabric D is pottery with thick sturdy section and red slipped surface. The main distinguishing feature of fabric D is incised designs on the interior as well external surface. The shapes of this fabric are also peculiar- heavy jars, basins and troughs. Fabric E comprised vessels with buff or reddish buff slip painted in black and sometimes in white pigment. Fabric F consist of grey pottery painted in both, black and white. J.S. Nigam reclassified the ceramic assemblage of the early Harappan levels of Kalibangan broadly into three major wares viz. red, buff and grey (Nigam, 1996:7-14). 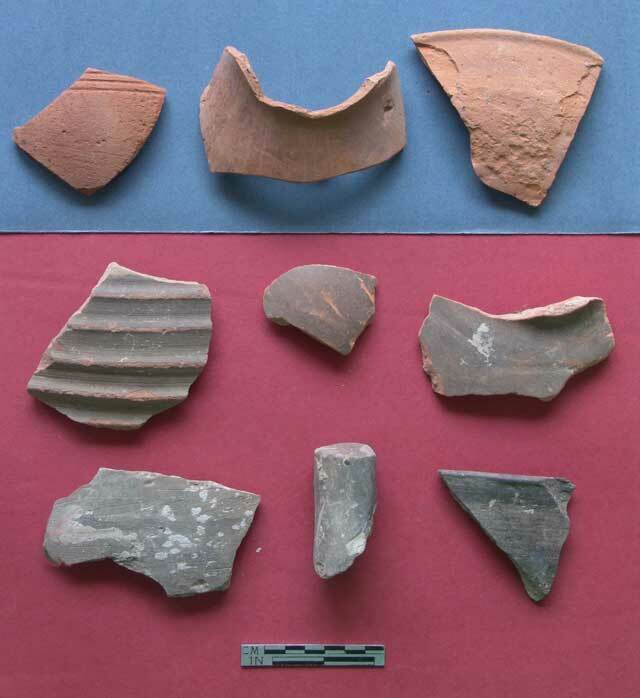 He included Thapar's Fabrics B, C and D in the category of the red ware. In each of the wares classified by Nigam pottery technically shares the mode of manufacturing, decorations and some popular shapes. The red ware included bowl with vertical, internally bevelled, everted out turned or out –curved, thickened rims and convex or tapering profiles, with ring pedestal base, and vases of various size with out-turned and out-curved rims. The paintings are in back and in bichrome. The shapes in buff ware were limited to chalice and a few vases. The paintings are rendered in black, occasionally using white pigment also. The grey ware consists of bowls with vertical rim and vases with flaring mouth. Though painted pottery is rare still some examples can be seen with white along with black paint (Nigam, 1996:7-14, Fig 3, 7). Besides classification of early Harappan pottery it is important to note his observations, “The foregoing explication of the Sothi pottery at Kalibangan clearly demonstrates that there were two distinct strains, one represented by the 'ill-bred' or 'ill-textured' and the other with better texture. It is an established fact that both these ceramic traditions occur together in the same levels. Do they have different origins? It is difficult to answer precisely at our present stage of knowledge (Nigam, 1996:11). Further, “…it may be surmised that the Sothi culture with its 'ill-bred' or 'ill-textured pottery' originated in Ghaggar/ Saraswati/ Hakra valley in the desert region of Cholistan and northern Rajasthan. It was locked up with the people manufacturing 'better textured' pottery sometimes in their initial stage and the result was conglomerate ceramic industry during the Sothi/ Early Harappan phase. This hypothesis has to be conformed by further field work in Sindh, Rajasthan and Haryana” (Nigam, 1996:112). Katy Frenchman prefers to use terminology 'Sothi Culture' for Early Harappan cultural complex present at Sothi, Kalibangan, Binjor etc. She has classified Sothi pottery in parallel striated red ware, dendritic red ware, plain and painted black incised red ware, black and red slipped incised red ware, ridged ware, black and white painted red ware, incised and red painted buff ware, black slipped red ware and plain & black slipped red ware (Frenchman, 1972: 159-89). On the basis of the small scale excavations carried out at Siswal, Suraj Bhan propounded existence of a region culture parallel to the early, Mature and late Harappans: “The ceramic industry of Siswal is divisible into three groups, Siswal A yielded the Kalibangan I Ware, with all the typical fabrics (A to F). Fabric A is painted with white pigment in addition to the black. In Siswal B the late Siswal phase, are found both the Late Siswal and the Harappan Wares. The former is marked by evolved Kalibangan I shapes bearing only black paintings. 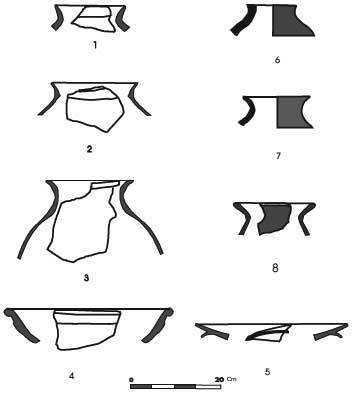 Although all the six fabrics survive in the ware, it lacks in variety in shapes and designs and is generally sturdier and better plotted than the Kalibangan I ware of the earlier phase” (Bhan, 1975:103). He has separated non- Harappan sites on the basis of presence of a worn out medium thick red ware treated with red slip and painted with black bands. In spite separating 'non- Harappan' culture he admits 'close relationship between these in typology, fabric, firing, plotting, rustication and incised decoration and Siswal or derivative wares'. The question remains- How different is the Siswal A from the Kalibangan I or Sothi culture? Further, in one of the most important contributions on the subject, while writing a chapter on pottery for Excavations at Kalibangan: The Early Harappans Madhu Bala finds Nigam's classification 'thought provoking' but retains Thapar's classification “which is more elaborate for obvious reasons and has been so far accepted” (Madhu Bala, 2003: 101). Besides six fabrics she has also added Hakra, Impressed and Reserve Slip wares as separate wares. 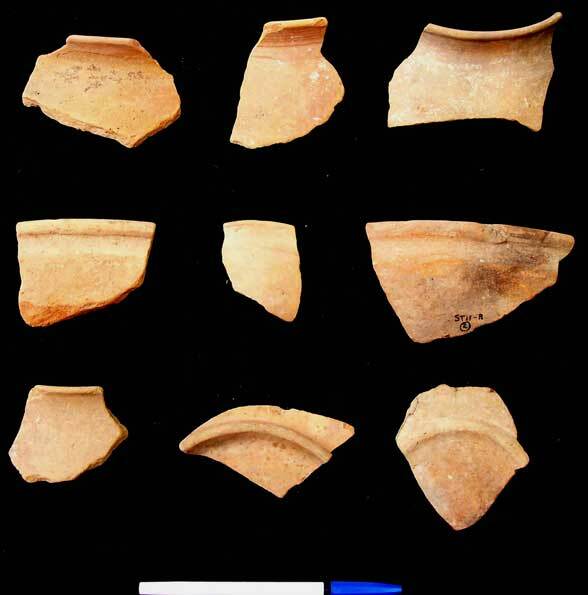 It appears that term 'fabric' has been used alternative for the general meaning of 'ceramic ware' by Thapar while classifying pottery of Early Harappan Kalibangan. As rightly pointed out by Dales, “The manner in which this early pottery is classified is, however, puzzling. It is said to be characterized by six “fabrics”, labelled for convenience as Fabric A to F (Thapar 1965:20). No definition of what “Fabric” means here is found in the preliminary reports. From the descriptions of each, it seems that the term is a general rubric for a group of pottery having similar paste, colour and surface decoration, but this is not absolutely consistent. What is certain here is that the vessel form has no part in definition “Fabric” and hence a fabric grouping at Kalibangan can include the entire range of vessels and forms. Conversely, a distinct vessel form can be included in more that one fabric grouping. As presented in the preliminary reports, this is an unsatisfactory approach to pottery classification” (Dales & Kenoyer, 1986:8). Hence, certainly term “Fabric” is not very suitable to indicate various pottery types based on either surface or shape morphology. Use of term “Fabric” in context of pottery studies should be restricted to indicate composition only. 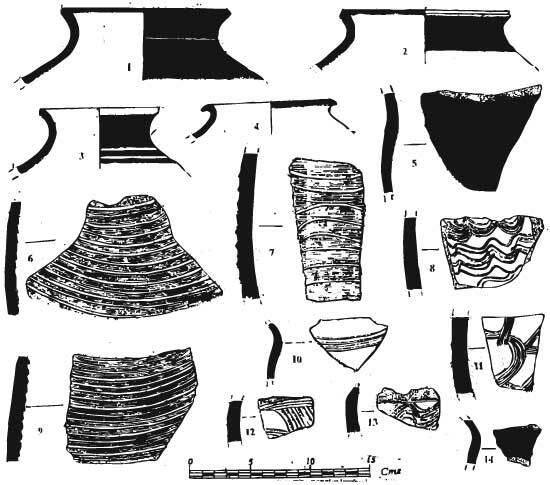 The classification proposed in the present paper (Fig.6) is essentially based on ceramic ware, which basically denotes colour of core material (Red, Buff and Grey), secondary criteria remains surface treatment and third is presence of shapes in a particular ware. The third criterion is again a subject of more detailed analysis, hence kept out of scope of this article. Another important issue is existence of different cultural complexes within chronological bracket of Early Harappans in the Chautang basin. Suraj Bhan has described Siswal A pottery it in terms of six fabrics of Kalibangan. While describing, he made important observations distinguishing Siswal A pottery from Kalibangan I, “Although the overall pattern of the painted designs shows individualistic features, the design elements are mostly common between Siswal and Kalibangan. But the former has less variety as compared to the latter. The main designs at Siswal include black bands, horizontal lines, zigzag horizontal or vertical lines, curvy lines, converging oblique strokes, suspended loops, fish scales, crossed hatched diamonds, apposed triangles, arcading designs, sigmas, fish, arrow, etc. The naturalistic designs such as the birds, plants, moustache like- bifold design, flower and trishula like motifs of Kalibangan are conspicuous by their absence at Siswal” (Bhan, 1975:104). More importantly he has also traced survival of this pottery in the later levels along with Mature Harappan pottery, separating it as Late Siswal Ware, “…is characterized by evolved types, austerity in shapes and designs, the absence of use of white pigment in paintings and the sturdy nature and better plotting of Kalibangan I industry. It retains all the Kalibangan I Fabrics though the bulk is constituted by Fabrics A and C. Fabric E and dull hand made red ware are rare, while the black and red ware is not met with” (Bhan, 1975:108). Stage 1 Pottery with three basic wares, namely red, buff and grey with incisions, monochrome and bichrome paintings with limited designs, more percentage of handmade and slow wheel pottery Lowermost levels of Birrana, Rakhigarhi and Sothi 6000(?) - 4600-3800 B.E.C. Stage 2 Continuity of the wares present in earlier level, with higher percentage of slow wheel pottery along with considerable presence of fast wheel pottery Siswal A, Middle and Upper layers of Sothi 3800-3200 B.E.C. Besides evolution of the Sothi culture in three stages, there is a possibility of continuity of one of these stages for a longer time and abandonment of the site in either stage one or two. This is a probable explanation for existence of variations in similar type of pottery found on several small size Sothi-Siswal sites. This hypothesis has to be tested on more number of excavated sites. 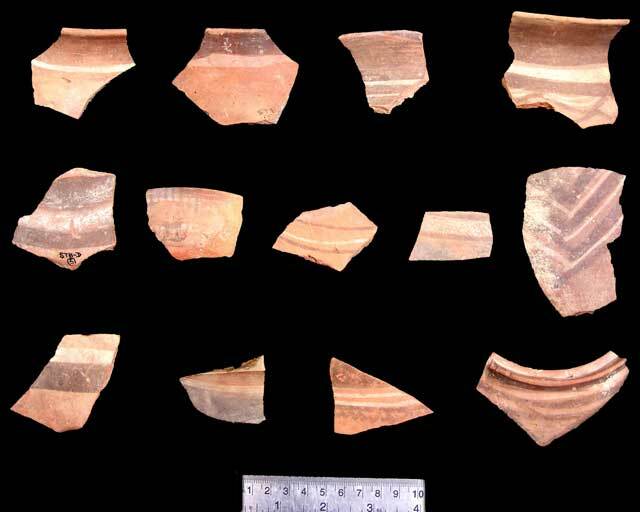 Further research can throw more light on the ceramics and evolution of the early Harappan culture in the Ghaggar-Chautang basins. While summarizing the results of Excavations at Kalibangan:: the Early Harappans, J.P. Joshi observes, “… Some sherds are akin to Hakra and a few greyish sherds and knobbed wares akin to Rehman Dheri I. Some sherds of Reserved slipped ware are also available. While Kot Diji, Gumla, Sarai Khola, Jalilpur and Harappa have many comparable forms, designs and shared features, there are regional variations also, which set on one hand some commonness and a regional dynamism leading to an evolutionary trend. This has happened at Kot Diji, Rehman pheri, Kunal, Banawali, Kalibangan. Sarasvati Valley in the Indian Union was an important region of Early Harappan emergence showing gradual development” (Joshi, 2003:21-2). The comparative analysis of the regional cultural complexes termed as the Early Harappan cultures would lead to better results to understand evolution of the Harappan culture. For now it remains subject of further analysis. The author would like to thank authorities of Central Antiquities Collection, Archaeological Survey of India and Indian Archaeological Society, New Delhi for availing all research facilities necessary for the present article. Sh. Jassu Ram deserves special appreciation to for drawing pottery, without which this article was incomplete. Bhan, Suraj 1972, Prehistoric Archaeology of the Saraswati and the Drishadwati Valley (Haryana), M.S. Univesity, Baroda (Unpublished PhD Thesis), pp-42-59, 100-3, 315. Bhan, Suraj 1975, Excavations at Mitathal (1968) and other Explorations in Sutlej-Yamuna Divide, Kurukshetra University, Kurukshetra, pp.104, 111. Dales, F. George & Kenoyer, J.M. 1986, Excavations at Mohenjodaro, Pakistan: The Pottery, University of Pennsylvania, p- 8. Dalal, K.F. 1980, A Short History of Archaeological Explorations in Bikaner and Bahawalpur along the ‘Lost’ Saraswati river, Indica, 17, No1, pp.4-40. Dikshit, K.N. 1980, A Critical Review of Pre- Harappan Cultures, Man & Environment, Vol. IV, pp.32-43. Dikshit K.N. 1984, The Pre- Harappn Cultures in Rajathan, Bharati, Banras, pp.55-70. Frenchman, Katy 1972, Prehistoric Pottery Industries along the “Lost” Saraswati of Great Indian Desert, University of Poona, (Unpublished PhD Thesis), pp- 159-89. Garge, Tejas 2005, Salvage Archaeology for the Vanishing Harappans in Haryana, Puratattva (35) New Delhi, pp.94-101. Ghosh A. 1989, The Rajaputana Desert- Its Archaeological Aspect in An Archaeological Tour Along the Ghaggar- Hakra River (Ed. S.P.Gupta) Kusumanjali Prakashan, Meerat, pp-98-106. Indian Archaeology - A Review,1980-81, p - 16. Indian Archaeology - A Review,1999-2000, pp. 30-3. Joshi, J.P., Madhu Bala and Jassu Ram, 1984 The Indus Civilization: A reconstruction on the Basis of Distribution Mapsin Frontiers of the Indus Civilization, Books & Books, New Delhi, pp- 511-530. Joshi, J.P. 2003, Summery of Results in Excavations at Kalibangan: The Early Harappan (1961-1969), Archaeological Survey of India, New Delhi, pp.17-24. Madhu Bala 2003, The Pottery in Excavations at Kalibangan: The Early Harappan (1961-1969), Archaeological Survey of India, New Delhi, pp. 101-122. Mughal, M. R. 1997, Ancient Cholistan: Archaeology and Architecture, Ferozsons (Pvt.) LTD, pp. 63-87. Nath, Amarendra 1998 Rakhigarhi: A Harappan Metropolises in the Saraswati- Drishdwati Divide, Puratattva No.28, New Delhi, pp-39-45. Nigam, J.S. 1996, Sothi pottery at Kalibangan: A Reprisal, Puratattva- No.26, pp. 7-14. Sing, Amar (1981) Archaeology of Karnal and jind Districts (Haryana), Kurukshetra University (Unpublished PhD Thesis), pp-80, 89.